HILO, Hawaiʻi - The Public Access, Open Space, and Natural Resources Preservation Commission got an update the pursuit of treasured lands in North Kohala. From the 2018 PONC report, priority number 3 is the Hapuʻu to Kapanaiʻa Cultural Corridor, in the heart of Kamehameha I’s homeland in North Kohala. (BIVN) – A commission tasked with prioritizing the purchase of privately held Hawaiʻi lands got an update on recent acquisitions, as its new report to the mayor again identifies multiple parcels in North Kohala worthy of preservation. The Public Access, Open Space, and Natural Resources Preservation Commission (PONC) has been submitted the 2018 Report to the Mayor. The document is also available to the public for viewing. 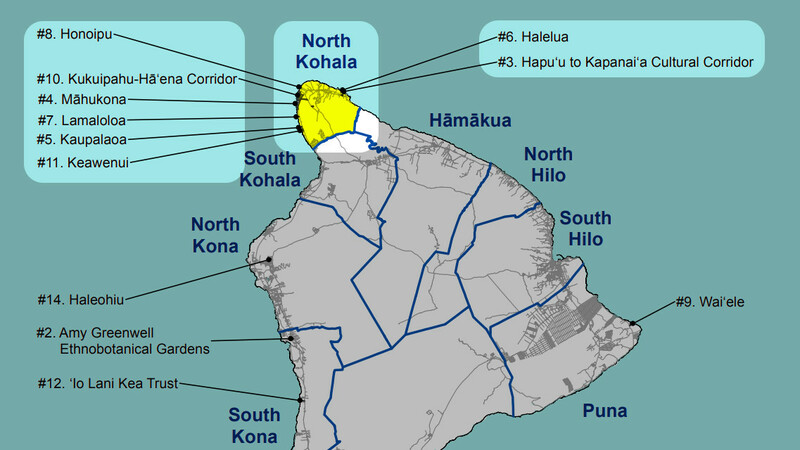 Of the 13 locations listed as top priorities for preservation, 8 are in the North Kohala district. Listing a property in the annual report is the first step. Next, the Hawaiʻi County Council must approve a resolution allowing the Hawaiʻi County Finance Department to negotiate for the purchase of the land using money from the 2% Land Fund, so named because the fund derives from 2% of real property tax collections. Speaking at a recent PONC meeting in Hilo, Hawaiʻi County Property Manager Hamana Ventura gave the commissioners an update on recent purchases pertaining to the treasured Kulā Iwi o Kamehameha in North Kohala. Video by David Corrigan, recorded on January 14, 2018. “We put in an application for just under $1.5 million dollars in matching funds and we’re pretty confident that based on our presentation and the feedback from the Commission that we’re going to be able to move forward with this purchase,” Ventura said.